The early July statistics (1st -28th) show a stark contrast in the UK between parts of the north and south as far as rainfall is concerned. 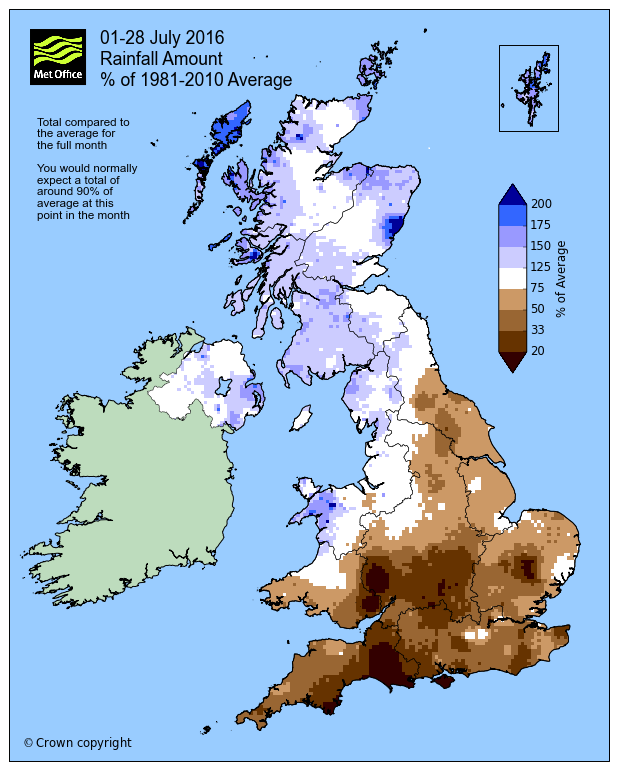 St Catherine’s Point, on the Isle of Wight, recorded only 1.4 mm of rain, currently the stations driest July on record. Meanwhile the month saw some very wet weather in the northwest, with Stornoway Airport recording 140.0 mm (87% above average) ranking it currently as its 3rd wettest July on record (wetter years being 1939 with 143.7 mm and 1988 with 164.5 mm). Despite the general perception by many that we are having a bad summer overall it is currently the 6th driest July on record for south east and central south England (19.8 mm) with much of southern England seeing less than 20 mm of rain this month.